Like all agencies, the Department of Natural Resources exists because the citizens have identified a need for the work we do. Marylanders recognize that the health of our society and economy is dependent on the health of our environment. The Department of Natural Resources leads Maryland in securing a sustainable future for our environment, society, and economy by preserving, protecting, restoring, and enhancing the State's natural resources. In the Coastal Fisheries Program, we address the goals of Fisheries Service through conducting surveys, working with our management partners, and working within our own agency to meet the needs of Maryland's citizens. 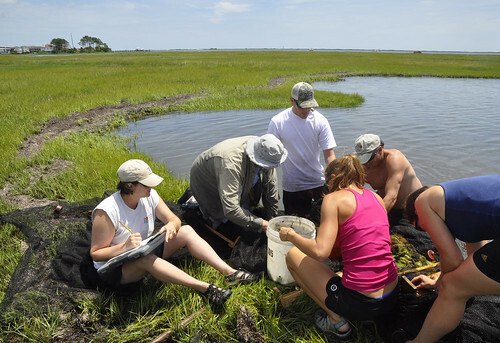 Characterize the stocks and estimate relative abundance of juvenile and adult marine and estuarine species in the Coastal Bays and near-shore Atlantic Ocean. Develop annual indices of relative abundance, age and length frequencies, and other needed information necessary to assist in the management of regional and coastal fish stocks. Delineate and monitor areas of high value as spawning, nursery, and/or forage location for finfish in order to protect against habitat loss or degradation. Outside of the formal mission statements and objectives, each of us does this job for more personal reasons. Working for Fisheries Service on Maryland's Coast is something each of us does because we have a passion for the outdoors, fishing, natural resource conservation, science, preserving the seafood industry, Maryland's Coastal Bays. Our positions are rewarding, if sometimes difficult.